Only six athletes have competed in four Olympic sports: three of them did so at the 1896 Olympics (with low participations), and three participated in four different skiing disciplines. The most successful of this sextet is Carl Schuhmann. 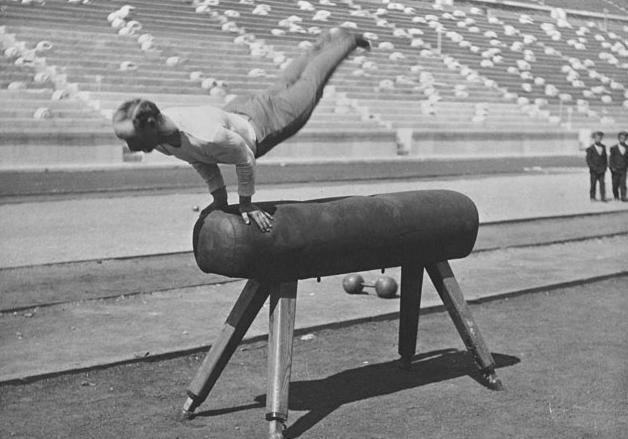 The German was first and foremost a gymnast. He won three first prizes in Athens, individually in the horse vault, and twice with the German team. With the exception of rope climbing, he competed in all gymnastic events. His second sport was wrestling. In the small field of five, the native Berliner competed against home favorite Tsitas. The final lasted for forty minutes when it had to be postponed due to darkness setting in. The following morning, Schuhmann decided the contest in his favor, but he remained very popular with the Greek public. The tiny (1.58 m) Schuhmann further competed in weightlifting and athletics, but did not place among the first three. The 1896 Olympics were the biggest success in Schuhmann’s career, although he had several good showings at the annual German Turnfest. He did remain involved in the Olympics, visiting Athens for a second time in 1906 as a guest of honor and German team leader. Two years later, he was Germany’s team attaché in London, the city where had been a gymnastics teacher since 1898. One of his pupils, Otto Bauscher, represented Great Britain at the 1908 Games. His final Olympic appearance was in 1936, when he was even part of a gymnastics exhibition and tribute in the Olympic Stadium, despite being well into his 60s.